In this time of often precarious funding at many colleges and universities, any case that can be made to illustrate how a department strategically fits into the overall university mission is not only worth merit, but an essential survival technique. This “strategic credibility” within the university is a vital form of currency in determining institution-wide resources prioritization, collaboration opportunities between organizational units, and overall direction of departments. This poster provides a case study of academic special collections in the Northwest and examines the methods these departments use to demonstrate value to the university. 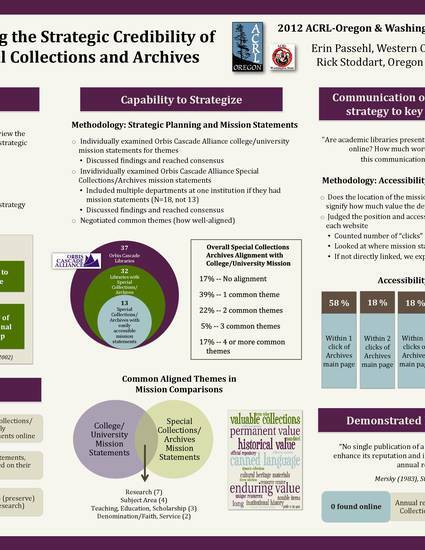 This poster considers how well do special collections align their efforts toward a university’s strategic goals or mission, as well as what efforts they undertake to maintain credibility within the larger institutional context. Outcomes of this poster include a potential methodology for all library departments to assess their “strategic credibility” and suggestions on how to communicate this value to the library and within the university as a whole. Poster given at the 2012 ACRL Oregon/Washington joint conference.